Strike Pro Armour Braid is made from 100% Premium PE Fibres using cutting edge braiding technology which has practically eliminated negative effects of friction on the fibre. Strike Pro Armour Braid is a very strong PE fibre braided line. A special coating makes Strike Pro Armour Braid extremely abrasion resistant – 6 x strong more than the average monofilament line. 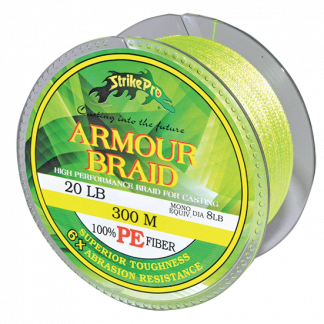 Strike Pro Armour Braid is a soft supple braid, that has near zero stretch, offers excellent castability, optimum knot strength and is suitable for all styles of reels. Strike Pro Armour Braid is suitable for soft plastics fishing, bottom bouncing, vertical jigging, trolling or when light bite detection is required. Strike Pro Fluorocarbon Leader Line is 100% Fluorocarbon. It’s special coating gives it a high abrasion resistance and excellent tensile knot strength. It is virtually invisible underwater and it is fast sinking. 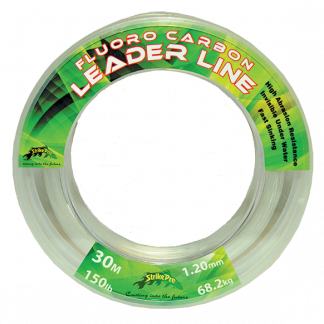 Fluorocarbon leader line is ideal for Snapper anglers down south and Barra anglers up north. It will also be fantastic for sportsfishers targeting pelagic species. Strike Pro IGFA Pro Tournament is an IGFA compliant line. This means that the line will pass the IGFA test whenever you catch a record fish. 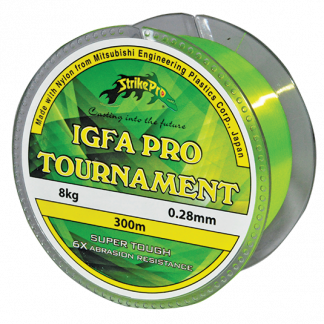 Strike Pro IGFA Pro Tournament is 6 x more abrasion resistant than most other IGFA Class nylon lines, is soft and has a very high knot strength. Strike Pro IGFA Pro Tournament is chosen by tournament anglers striving to catch a record breaking fish and have it recognised by the International Game Fishing Association. 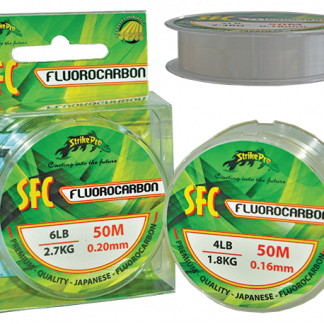 Strike Pro ‘SFC’ Special Formula Coated Fluorocarbon is 100% fluorocarbon construction. It’s Special Formula Coating offers superior abrasion resistance, very high knot strength and it’s low stretch core aids in bite detection. which eliminates damage to the fluorocarbon and allows the fluorocarbon to lay flat for precise presentation.